Casino Club review and bonuses list. CasinoBonusNews → Casinos → "Casino Club review"
Is it a trip back in time to the golden age of casinos, or is a skip into the future of online gaming. 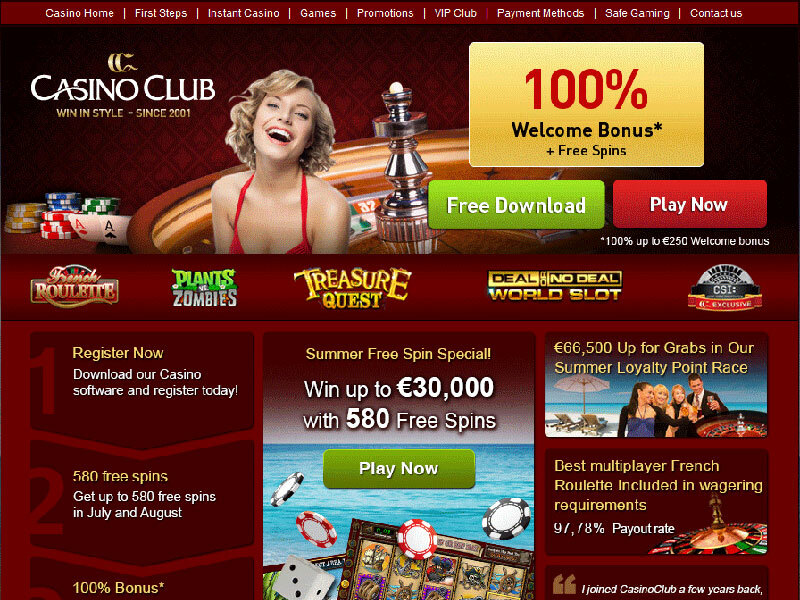 Perhaps it’s both with CasinoClub Online and its alluring Web site and attractive gaming. Being an online casino since 2001 gives it the long-lasting credibility that keeps it in service, while being a part of the new GTECH G2 platform means it has its eyes on the future. From the moment Web surfers show up at its site, CasinoClub makes its guests feel welcomed and returning players understand that the casino’s staff is keeping up with their needs. The current welcome package for new players includes a 100 percent bonus on new players’ first deposits up to $250. Then, the casino grants players a slew of secondary promotions, which currently include a reload bonus of 100 percent matching bonus money on deposits up to $200 coupled with 50 free spins on the Crazy Wizards slot machine. Unlike some casinos, CasinoClub offers players a handy promotional calendar which lists special comps on a day-by-day basis. Daily bonuses could involve anything from free spin bonuses to double comp points on certain games to shopping vouchers. The comp points are a part of the loyalty program that each player is enrolled into automatically, so that with every wager a player makes, points accumulate into an account and, after enough points are earned, the player converts them into credits added to the real money account. After checking out the casino, some players may want to spread the word that CasinoClub is THE place to hang out. Players who refer their friends to the online casino and convince them to sign up and make a deposit of at least $50, then the original player is credited with $50 in bonus funds to play with. This is on top of the numerous reload bonuses and giveaways that Casino Club is in charge of every month, so players must keep checking the site to keep on top of the hottest offers. The games for gamblers to become lost in include the top-of-the-line video slot machines available. More than 60 slots are lined up on the casino floor, including one based on the popular PC game Plants Vs. Zombies. The ever-popular game show Deal Or No Deal has a slot machine here as well, or player can choose from any of the themed games available, from pirates to mobsters to race car drivers. After checking out the slots, players can slide their chips over to the table games, which include the ever present blackjack and its tables with various rules. CasinoClub offers five unique types of roulette from the traditional board to Card Roulette. Players can live in their own little world of scratch card lottery fun, or exist in the virtual world of video poker. Serious gamblers should also check out the keno and card games on hand, like baccarat, craps, war and Casino Dice. Many of these games can be enjoyed either by downloading the software version of the casino or by enjoying the flash version, although Casino Dice and other games are exclusively Flash-based. CasinoClub gives players around the world a choice of payment methods, some of which are universal and some can only be used in specific countries. Deposits can be made through Click2Pay, ClickandBuy, bank transfer, ECO Card, EUTeller, PaySafe, NETeller, Poli, WebMoney or a host of methods based on the player’s location. Simply go to the cashier tab after logging into the account, and the current available options will be listed for that area. To withdraw funds, players can use credit cards, ECO Card, eWire, Moneta.ru, MoneyBookers, NETeller, WebMoney, Click2Pay, ClickandBuy, bank transfer or Abaqoos. Technical support is available 24/7, starting with the live chat support found through the site. Help is also available through Email, toll-free telephone numbers or even fax.